Sweden Finns (Finnish: ruotsinsuomalaiset; Swedish: sverigefinnar) are a Finnish-speaking national minority in Sweden consisting of Finns historically residing in Sweden as well as Finnish immigrants to Sweden. Sweden-Finns should not be confused with the Swedish-speaking Finland-Swedes in Finland, who comprise a linguistic minority in Finland. People with Finnish heritage comprise a relatively large share of the population of Sweden. In addition to a smaller part of Sweden Finns historically residing in Sweden, there were about 426,000 people in Sweden (4.46% of the total population in 2012) who were either born in Finland or had at least one parent who was born in Finland. Like the Swedish language, the Finnish language has been spoken on both sides of the Gulf of Bothnia since the late middle ages. Following military campaigns in Finland by Sweden in the 13th century, Finland gradually came under Swedish rule and made Finns in Finland and Sweden were subjugates of Sweden. Already in the 1400s, a sizeable population of Stockholm spoke Finnish, and around 4% in the 1700s. Finland remained a part of Sweden until 1809 when the peace after the Finnish War handed Finland to the Russian Empire, though leaving Finnish populations on the Swedish side of the Torne river. In the 1940s, 70,000 young Finnish children were evacuated from Finland. Most of them came to Sweden during the Winter War and the Continuation War, and around 20% remained after the war. Helped by the Nordic Passport Union, Finnish immigration to Sweden was considerable during the 1950s and 1960s. In 2015, Finnish immigrants to Sweden made out 156 045 persons (or 1.58% of the Swedish population) Not all of them, however, were Finnish speakers. The national minority of Sweden Finns usually does not include immigrated Swedish-speaking Finns, and the national minority of Sweden Finns is protected by Swedish laws that grant specific rights to speakers of the Finnish language. English somewhat lacks the distinction between Finns in Sweden (Swedish: sverigefinländare), which emphases nationality rather than linguistic or ethnic belonging and thereby includes all Finnish heritage regardless of language, and Sweden Finns (Swedish: sverigefinnar) which emphases linguistic and ethnic belonging rather than nationality and usually excludes Swedish-speaking Finns. Such distinctions are, however, blurred by the dynamics of migration, bilingualism, and national identities in the two countries. Note that speakers of Meänkieli are singled out as a separate linguistic minority by Swedish authorities. Dimensions of language, ethnicity, and origin complicate the terms dividing the populations of Finland and Sweden. In Finland, both Swedish and Finnish are official languages. The Swedish-Finns are Finnish nationals who speak Swedish. The variant of standard Swedish spoken in Finland is called Finland Swedish or Finno-Swedish, and those who speak it are Finland-Swedes. Because of the shared language, Finland-Swedes are overrepresented in the migration of Finnish nationals to Sweden. Swedish-speakers make out 5.3% of the total Finnish population, while around 20% of Finnish immigrants to Sweden were Swedish-speakers according to a 2004 estimation. Sweden-Finns, however (this article), refers rather to Finnish-speaking Finns in Sweden, since Swedish authorities connect the rights of this national minority with the usage of the Finnish language. Using a wider definition, people of Finnish origin, regardless of language, may be Sweden Finns (in the sense of Finnish nationals in Sweden). In Swedish, the term sverigefinländare includes both language-groups while sverigefinnar, and the less common sverigefinlandssvenskar, refers to the Finnish-speaking and Swedish-speaking groups respectively. In addition to Finnish immigrants, the term Sweden Finns also includes Finns historically residing in Sweden. A small group of ethnic Finns with origins in Ingria in East Karelia would also be Sweden Finns on ethic and linguistic basis. After the Second World War, around 4500 refugees came to Sweden from Ingria. In the 16th and the 17th century large groups of Savonians moved from Finland to Dalecarlia, Bergslagen and other provinces where their slash and burn cultivation was suitable. This was part of an effort of the Swedish king Gustav Vasa, and his successors, to expand agriculture to these uninhabited parts of the country which were later on known as "Finn woods" (Finnskogar). In the 1600s, there were plans to set up a new region Järle län that would have contained most of the skogsfinnar. It should be noted that in Sweden at this time, all legislation and official journals were also published in Finnish. Bank-notes were issued in Swedish and Finnish etc. After 1809, and the loss of the eastern part of Sweden (Finland) to Russia, the Swedish church planned a Finnish-speaking bishopric with Filipstad as seat. However, after the mid-1800s cultural imperialism and nationalism led to new policies of assimilation and Swedification of the Finnish-speaking population. These efforts peaked from the end of the 1800s and until the 1950s. Finnish speakers remain only along the border with Finland in the far North, and as domestic migrants due to unemployment in the North. Depending on definition they are reported to number to 30,000–90,000 — that is up to 1% of Sweden's population, but the proportion of active Finnish-speakers among them has declined drastically in the last generations, and Finnish is hardly spoken among the youngsters today. Since the 1970s largely unsuccessful efforts have been made to reverse some of the effects of Swedification, notably education and public broadcasts in Finnish, to raise the status of Finnish. As a result, a written standard of the local dialect Meänkieli has been established and taught, which has given reason to critical remarks from Finland, along the line that standard Finnish would be of more use for the students. The Finnish immigrants who moved to Sweden in the 1950s and 1960s were sometimes despised as being a very "low-class" people, as portrayed in the Swedish book and movie Svinalängorna. In 2009, Maria Wetterstrand, Swedish politician and then leader of the Green Party, wrote a Swedish article in Dagens Nyheter about this, and demanded that Sweden ought to give Finland an official apology. Matti Vanhanen, then Prime Minister of Finland, responded in 2011 that an apology was not needed. The city of Eskilstuna, Södermanland, is one of the most heavily populated Sweden Finnish cities of Sweden, due to migration from Finland, during the 1950s until the 1970s, due to Eskilstuna's large number of industries. In Eskilstuna, the Finnish-speaking minority have both a private school (the only one in the city of Eskilstuna, there is no public school or teachers in Finnish at the public schools. Only the lower level is in Finnish, upper level is in Swedish) and only one magazine in Finnish. Some of the municipal administration is also available in Finnish. In the Finnish mindset, the term "Sweden Finns" (ruotsinsuomalaiset) is first and foremost directed at these immigrants and their offspring, who at the end of the 20th century numbered almost 200,000 first-generation immigrants, and about 250,000 second-generation immigrants. Of these some 250,000 are estimated to use Finnish in their daily lives, and 100,000 remain citizens of Finland. This usage isn't quite embraced in Sweden. According to the latest research by Radio of Sweden (Sveriges Radio), there are almost 470,000 people who speak or understand Finnish or Meänkieli, which is about 5.2% of the population of Sweden. In the Swedish mindset, the term "Sweden Finns" historically denominated primarily the (previously) un-assimilated indigenous minority of ethnic Finns who ended up on the Swedish side of the border when Sweden was partitioned in 1809, after the Finnish War, and the Russian Grand Duchy of Finland was created. These Finnish-speaking Swedes are chiefly categorized as either Tornedalians originating at the Finnish–Swedish border in the far north, or skogsfinnar ("forest Finns") along the Norwegian–Swedish border in Central Sweden. In 2011, a detailed genetic study was made in order to, among other reasons, see how similar the Sweden Finns were to the native Swedes. Each samples in the study were looked at individually, to make sure that the Swedes had full grandparental ancestry from their represented Swedish regions respectively, and the Sweden-born Finns having all of their ancestry from Finland. The Swedes who showed the closest FST distance (meaning greatest genetic similarity) to the Sweden Finns were those from East Middle Sweden and North Middle Sweden, having distances of 4.66 and 4.67. The most similar Swedes after those were the ones from Stockholm (4.81). Upper Norrland was the second most distanced (and thus one of the most dissimilar), at 5.61. The greatest FST distance between the Swedes and the Sweden Finns was 5.63, and that accounted for the Swedes who came from the southernmost regions. The greatest FST distance within the Swedish group as a whole, for comparison, was between Southern Sweden and Upper Norrland (3.19), despite Upper Norrland being one of the most distanced Swedish groups from the Sweden Finns as well. Today, Finns are the largest immigrant group in Sweden, and Finnish is an official minority language of Sweden. 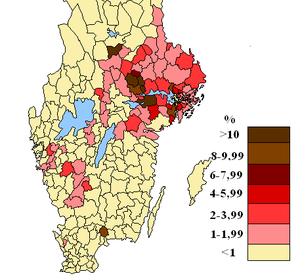 The benefits of being a "minority language" are however limited to Finnish-speakers being able to use Finnish for some communication with local and regional authorities in a small number of communities (Borås, Borlänge, Botkyrka, Degerfors, Enköping, Eskilstuna, Fagersta, Finspång, Gällivare, Gävle, Göteborg, Gislaved, Hällefors, Håbo, Hallstahammar, Haninge, Haparanda, Hofors, Huddinge, Järfälla, Köping, Kalix, Karlskoga, Kiruna, Lindesberg, Ludvika, Luleå, Malmö, Mariestad, Motala, Norrköping, Nykvarn, Oxelösund, Pajala, Söderhamn, Södertälje, Sandviken, Sigtuna, Skövde, Skellefteå, Skinnskatteberg, Smedjebacken, Solna, Stockholm, Sundbyberg, Sundsvall, Surahammar, Tierp, Trelleborg, Trollhättan, Trosa, Uddevalla, Umeå, Upplands-Väsby, Uppsala, Västerås, Norrtälje, Upplands-Bro, Älvkarleby, Örebro, Örnsköldsvik, Österåker, Östhammar, Övertorneå) where Finnish immigrants make up a considerable share of the population, but not in the rest of Sweden. ^ "Ds 2001:10 Mänskliga rättigheter i Sverige". The Government of Sweden. p. 20. Retrieved 23 February 2017. ^ "Fler med finsk bakgrund i Sverige". Sverige Radio. Retrieved 2 March 2013. ^ "Finland och Irak de två vanligaste födelsälnderna". Statistics Sweden. 2005. Retrieved 23 February 2017. ^ "Nationella minoriteter". The Government of Sweden. Retrieved 23 February 2017. ^ "Population". Statistics Finland. Retrieved 23 February 2017. ^ de Geer, Eric. Den finska närvaron i Mälarregionen (PDF). pp. 12–13. Archived from the original (PDF) on 16 August 2016. Retrieved 23 February 2017. ^ "En stärkt minoritetspolitik - översyn av lagen om nationella minoriteter och minoritetsspråk". The Government of Sweden (Ds. 2016:73). Retrieved 23 February 2017. ^ "Historik". Sveriges Ingermanländska Riksförbund. ^ Lag (2009:724) om nationella minoriteter och minoritetsspråk. Swedish law on national minorities and minority languages (in Swedish). Retrieved 14 March 2013. ^ Förvaltningsområdet för finska. List of municipalities in the administrative area for the Finnish language, including municipalities added subsequently. Retrieved 31 May 2018.